This week, The Filta Group’s customers, franchise owners, and employees exceeded the company goal of raising $5,000 for the Oceans of Hope Foundation through a unique company-wide campaign. It’s simply an honor and a privilege to support an amazing foundation like Oceans of Hope. We couldn’t be prouder of Danny and the organization he has created to uplift the spirits of so many. The FiltaCares campaign is just a small way we can give back. The Oceans of Hope Foundation is one that carries a special meaning for everyone at The Filta Group as it was started by Filta’s own Danny Paltjon. The foundation, based out of Central Florida, was established to provide adaptive ocean sport opportunities to individuals with limited mobility. Danny was inspired to start the foundation after sustaining a serious spinal cord injury while playing in a Men’s softball game. Previously, an avid outdoorsman and athlete, he was unprepared to face his “new life” limited to a wheelchair. In light of this, Danny started the non-profit organization, which has given many the opportunity to experience the unique thrill of surfing. “It’s simply an honor and a privilege to support an amazing foundation like Oceans of Hope. We couldn’t be prouder of Danny and the organization he has created to uplift the spirits of so many. The FiltaCares campaign is just a small way we can give back to the community and share the positive message behind the Oceans of Hope Foundation. This year, we were especially pleased to increase overall company participation and include the entire franchise network in our campaign,” said Jason Sayers, CEO at the Filta Group. Since April, The Filta Group has donated $50 to Oceans of Hope for every new customer acquired by its national franchise network. On top of the $5,000 raised, Filta made an additional $1,000 contribution through a challenge made earlier this year at its annual conference for a total of $6,000 raised. “Without the help of our volunteers and corporate sponsors such as Filta, these events would not be possible. On behalf of the entire Oceans of Hope family, we can not thank everyone at Filta enough for their generosity. It means the world to those individuals who participate with us and regain some freedom that was lost due to injury or illness,” said Danny Paltjon, Oceans of Hope Foundation. 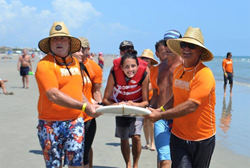 Oceans of Hope hosts seven events each year in New Smyrna Beach, Florida, from the Spring until Fall. If you are interested in learning more, volunteering, or making a donation please visit oceansofhopefoundation.org. The Foundation will be hosting a special training event on July 15 for new volunteers interested in becoming a part of the water team. Oceans of Hope Foundation, Inc. is a non-profit organization providing adaptive ocean sport opportunities to individuals with limited mobility. The Foundation’s mission is to broaden the horizons of outdoor recreation for those challenged in life. By doing so, the Foundation provides empowering ocean experiences that gives hope to individuals and loved ones living with mobility challenges. Visit oceansofhopefoundation.org to learn more.